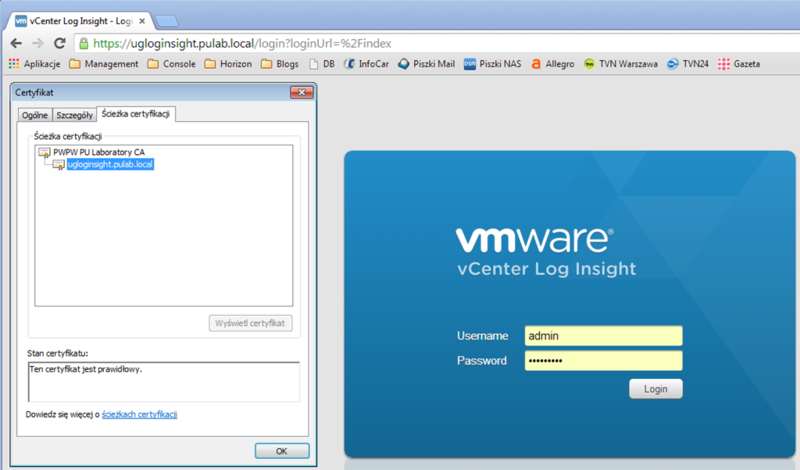 And it is not a separate case, I have three instances of Log Insight, and each behaves in exactly the same way. I searched the Internet, but I found very little and nothing that would solve my problem. After a few lost hours, I decided to solve this problem, as it has already done , picking the console. At the beginning we prepare ourselves in our CA (in my case Microsoft Server 2008R2 CA) parcel (pfx, or PKCS12) containing the CA certificate, RSA key and server certificate. Copy file in to our machine Log Insight. In the virtual machine console create a user in the group “wheel”, log in using putty and execute a series of commands (as root), starting from stop service loginsight. We already have a keystore file location and password to him and to the private key. In the next steps we substitute our own key and certificates. Using PKCS12 format has the advantage that it does not need to generate a private key in the keystore, it will be installed from our pfx file. If we carry out the process using openssl, it is best to also prepare the file in PKCS12 format, otherwise awaits us classical path (key generation, request and finally upload the certificate).